In 1915 Scottish author John Buchan wrote a action spy novel, involving a "man on the run" who proves himself extraordinarily resourceful while attempting to thwart nefarious plans. The novel was made into several films, including a famous version directed by Alfred Hitchcock. Ninety years later, a comedic version of the work opened and has proven deeply popular. 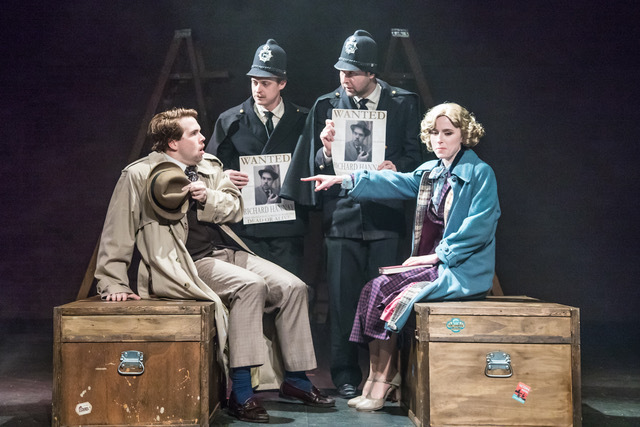 It is this The 39 Steps available at the Morgan-Wisxon Theatre. But what, perhaps you ask, is/are the 39 steps? Or, if you've seen the movie(s)/read the book maybe you wonder at transforming it into a comedy? Answering in reverse order, this play is a parody--but one made with love of the source material. Nearly all good parodies fall into this category such as Young Frankenstein or Something's Afoot! Essentially, our hero Richard Hannay (Christopher Tiernan) is a certain class of well-mannered Englishman living in London who finds himself accosted/involved with one Annabella Schmidt (Genevieve Kennedy). She warns him an evil mastermind and his agents will stop at nothing to stop her, that an important secret vital to the security of the United Kingdom is about to go abroad into the hands of an enemy. Among the tantalizing clues she reveals is that the secret has something to do with "the 39 steps" and that said evil mastermind is missing the first joint of his left pinkie. Within hours she is dead, murdered, but not before desperately seeking to know the location of a specific manor house in Scotland. Thinking himself watched (correctly) Hannay heads for Scotland, but when the body is discovered Scotland Yard thinks him the murderer. Several plot holes probably seem obvious at this point, such as why the man didn't go to the police immediately? And why didn't these ruthless killers do Hannay in when they had the chance? We don't have time to dwell on such, because frankly the plot proceeds at break neck speed from there. Here we see several elements in play that make the show so much fun. For one thing, every change of set (and there are many) is more or less done as some kind of set piece, at a pace very much in keeping with the story. More, they are often in some sense music or dance numbers, with an ever increasing number of gags woven in. On top of that, every single character in the play (other than our hero) is played by one of three other players. Most (but not all) of the female characters end up played by Kennedy, who shows off quite a nice range of body languages, accents, social classes, etc. All the other characters--middle aged charwomen, milkmen, numerous police officers, fellow train passengers, the evil mastermind and his minions, music hall performers, etc. all emerge from the talents of Tristan Griffin and Michael Mattsen. Often their costume changes consist of changing hats, or maybe a coat, sometimes these changes happening onstage to keep the breakneck pace going. All of which just adds to the fun! So too the several little homages to Hitchcock ("He's headed north by northwest!" for example) and the periodic radio broadcasts describing the police hunt for our hero--with a description of the man as increasingly attractive as his travails make him look more rugged, a fact the character (somehow) hears and finds quite nice to hear. At the same time, there are changes in rhythm, relatively quiet moments letting all of us catch our breaths. A long walk through the winding corridors of an old Scots manor, by candlelight, proves one of those, funnily surreal yet also full of subtle but rising tension. Let us never forget the great thing needed in comedy is timing! Readers of this blog probably know how much I likes me some angst, some tragedy, some drama both personal and existential. But I also love a good laugh and this is what this show delivers! 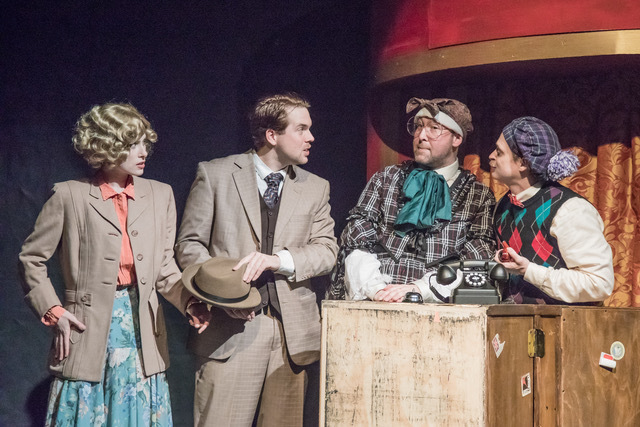 The 39 Steps plays Fridays and Saturdays at 8pm, Sundays at 2pm through February 10, 2019 at the Morgan-Wixson Theatre, 2627 Pico Blvd. (not far from the Bergamont Metro Train Station), Santa Monica CA 90405.